Hello, I am Alan GrassOnthego Barrera the Chief Gardener/Founder of GrassOntheGo. I was converted to wheatgrass years ago, when I was introduced to this green juice at a local juice bar, in Houston. After experiencing the taste, I had all my following shots with ginger added. Was not a fan of the taste, but was a fan of the benefits. After just a few trips, my body began to crave this green juice. I then realized it was not my brain controlling me making me drive and wait in line for this green juice. It was my body, controlling me. My brain new the taste of this green juice was (unappealing), yet my body craved it. And forced me to drive, wait, and then endure this green juice. The months that followed, I experienced consistently increasing positive benefits along with the difficulty of obtaining that green juice consistency. My green juice evolved from the juice bar, to the purchase of pallets and manual juicer($100), then to growing my own and the purchase of an electric juicer($300). Aquiring the electric juicer was an exciting day. After consistently taking my wheatgrass daily, my body started thanking me through more energy, becoming stronger, and feeling great. My brain thanked me also by pouring me with ideas, concepts, and theories. Just one idea which started everything was,” This green juice is amazing, and everyone should have it, but how?” but the taste, what to do about that? Another idea, I discovered the roots were surprisingly sweet and had a variety of nutrients and amino acids not found in the blades. So, I developed a new growing method, which allows access to the roots. Never before have roots been applied to wheatgrass, juice. This makes our juice better for you and dramatically improves the taste. Surprisingly, sweet!! I am proud to announce I made wheatgrass taste good! Sure there is a grassy taste at first, but then followed by a a sweet aftertaste. We go through extensive procedures, and inspections to verify our wheatgrass is consistently healthy, robust, and full of nutrients. Many people comment on our juice being, “So, Green.” Yes this is true, we believe a plant has only the nutrients that it is fed. So, we feed and feed our grass. The combination of nutrients and growing technique creates this remarkably, sweet, robust, dark green wheatgrass juice. The ability to grow, cut, juice, then flash freeze creates the GrassShot. Wheatgrass in a portable form. Just Grab and Grow! 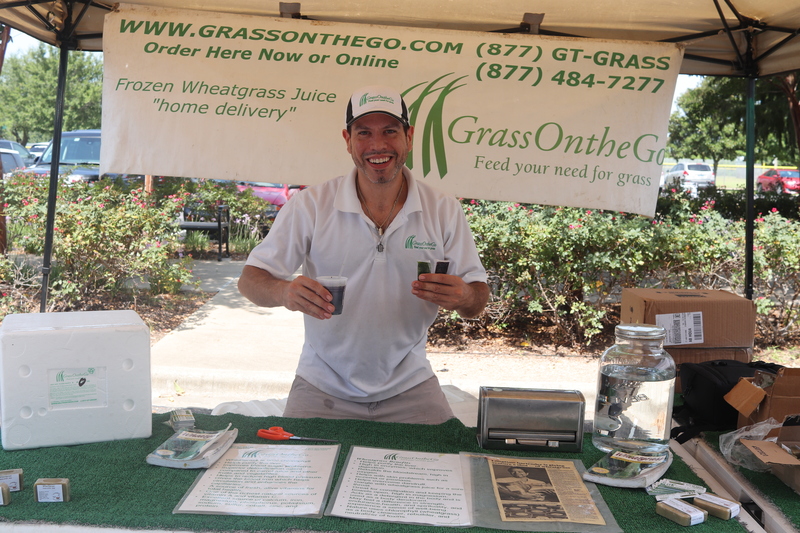 I am the proud Papa of every GrassShot, and embrace the consistent testimonials of wheatgrass being spread, experienced, and enjoyed!